Dot in left and S in right field, MKV in Exergue. Minted at officina S in Cyzicus (Balkiz, Turkey) in 312 A.D.
Sutherland, C.H.V., "Roman Imperial Coinage", Vol. 6 (RIC), Cyzicus, p593, nr 95, unlisted variety - 1st known with dot/S for Licinius? 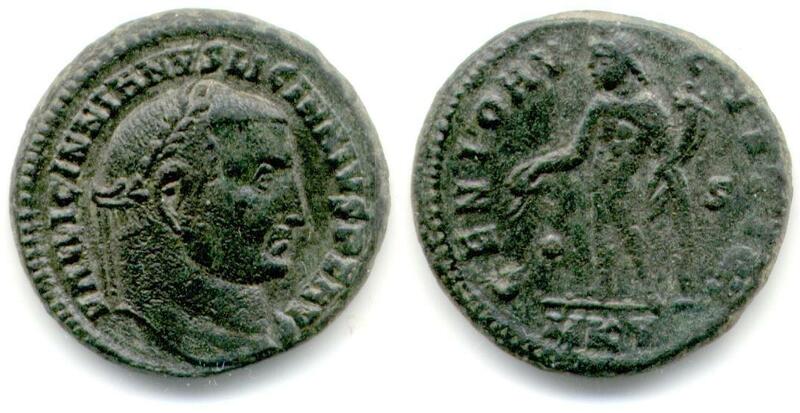 Van Meter, D., "Handbook of Roman Imperial Coins", p286, nr 10, variety with Ol/9.